After our move, I volunteered at the Guildhall Public Library and spent hours poring over old documents and photos I found on dusty shelves. When I became Town Clerk, one of the job’s greatest pleasures was organizing and becoming familiar with the old deeds, maps, school ledgers, photographs and town meeting minutes that overflowed out of the Town’s vault. I’ve visited and photographed all of Guildhall’s cemeteries, pored over documents in the old evidence room at the Courthouse, read several histories of Guildhall, and spent many a pleasant hour in conversation with Allen Hodgdon, our assistant and probate judge and the Town’s de facto historian. In spite of all this, for years, one little piece of Guildhall’s history had eluded me: the Monument. Since my arrival in town, I’d been hearing about a mysterious monument somewhere out in the woods, on Guildhall Hill. 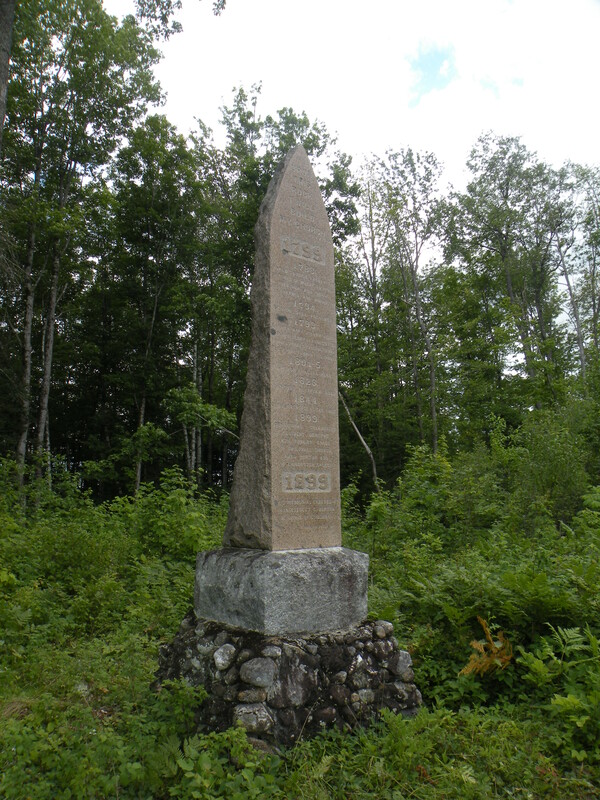 There are pictures of the monument in Patricia Rogers’ book The HIstory of Guildhall, Vermont. The monument was financed, designed, constructed, and then hauled up to Guildhall Hill by Everett C. Benton in 1899. There was a dedication ceremony held, with speeches at the site and then refreshments and music back at the existing (new) church and the Grange Hall in the Village. Colonel Benton was a Guildhall native who moved to the Boston area in the 1880s, but had retained his ties to his beloved town. After making the move to Boston, he’d become quite wealthy and had shared that wealth with the town of his childhood, building a Town Office, a public library/masonic temple, and his own summer house which came to be known as the Benton Cottage. (It’s now our home!). Most of the time, when we encounter monuments, they commemorate the war dead. But this one, curiously, has nothing to do with honoring the dead. It commemorates a particular Congregational Church, which at one time sat at that site on Guildhall Hill where the monument now stands. The text inscribed on the monument outlines the basic history of this church, starting with a town meeting in which voters appropriated 25 bushels of wheat to pay a preacher for the church. The church building was constructed at this spot around 1801-1803. There it remained, serving congregants until the late 1830s. For some reason that remains unclear, the church was dismantled and built elsewhere and ultimately was rebuilt again in Guildhall Village, where it still stands. Yesterday, I finally decided that it was time to see this hidden monument for myself. I thought I might be able to find it on my own, since several people who’d been up there in years past had described its location, at least roughly. 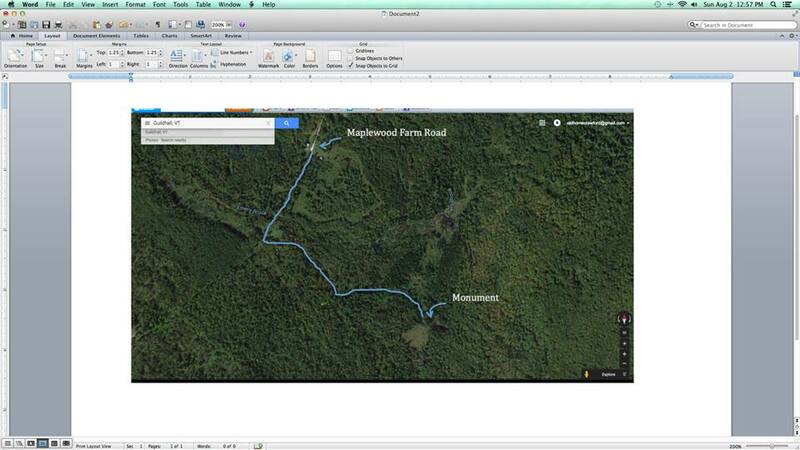 So I parked my car on Maplewood Farm Road and headed off on the Maplewood Farm trail. Eventually, this legal trail terminates onto Fellows Road, a Town Class 3 road. I’d been told to look for another trail veering off to the left. The problem is, by the time I’d worked my way all the way to the terminus, there had been 4 possible left hand trail turns. Two of them I ruled out, because they were level or sloped downward, and I knew that the correct trail should take me up a hill. But I followed two ascending trails for some distance without finding a thing. At that point, I knew I needed some help from someone who had actually been to the monument. Sadly, there is no sign or marker of any kind providing any clue. I headed back to the road and called Alfred and Susan McVetty, who live up on Stone Mountain. They agreed to take me up to the Monument on a four wheeler. The left hand trail, it turned out, was one I had tried, but the monument is a looong distance to the top. On my own, without knowing if I was on the right track, I wouldn’t have gone that far. On the ATV, the trail turned out to be navigable, but a bit on the rough side–it quailfied as bushwhacking. But it was worth it when suddenly, over the tops of some smaller trees, the top of the monument peaked out. I shouted out in sheer joy to see it! We got off our machines, walked about, and took photographs. The area is surrounded by thick forest and barely cleared, only because a few ATVs have been up there already this summer. A thick, imposing range of raspberry brambles covered what Alfred said was the old stone foundation of the church building. I wouldn’t have known this without him telling me. No one is maintaining the area around this monument. Although you can see Burnside Mountain over the forested area, in 5 or 10 years, if nothing is done to clear or maintain, the growth will overtake the monument completely. The monument itself is a beautiful piece of architecture. Its formal beauty is somewhat surreal when contrasted with the bramble, ferns and tree growth that will soon overtake it. It’s the sort of monument that you’d expect to see on a nicely groomed town green or park. And why, in 1899, did all of these people (see photograph) traipse up a steeply ascending trail in their best dress and hats for a mile to a spot that in 1899 was probably as remote from the habited part of town as it is today? Why did a 60 year old church building no longer in existence matter to them? I went looking for clues to this question in the Guildhall history books that exist, of which there are three or four. That provided some intriguing possibilities, but nothing conclusive. There is some reason to believe that in 19th century Guildhall, religious divisions were fairly sharp. The Town financed and established the Congregational Church around 1799 (I guess the separation of church and state concept hadn’t quite been tested yet in practice), and this was done through taxation. Those who submitted written statements asserting their membership in a different church were exempt from the tax. After the Congregationalists organized, a competing Methodist Church organized, as well, and there are some references in the literature to tension between the two churches. In 1844, the Congregationalists erected a new church in the Village, which remains the only church in Guildhall to this day. (See today’s photo of the church, which is seldom used. 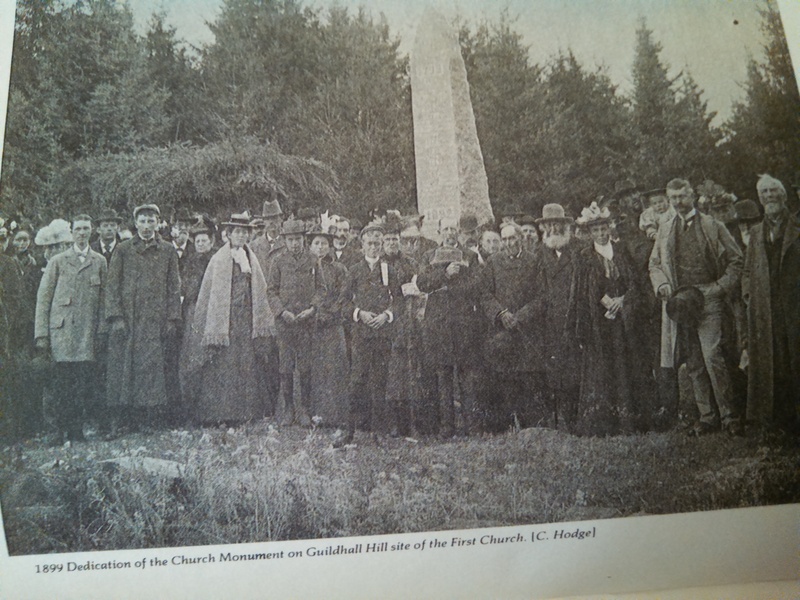 Sometimes funerals or weddings are held there) Through the 19th century, the competing Congregational and Methodist churches existed in Guildhall, but by the 1920s, church membership in either church was in decline, and the Methodist Church disbanded. By then, the tensions or differences (whatever they might have been) had been resolved enough that the two churches essentially merged, or put a different way, the Congregational Church “swallowed” the Methodist Church. But perhaps in 1899, those differences were still meaningful and alive for Congregational and Methodist membership. And perhaps those in the Congregationalist camp (whatever that meant) retained a sense of nostalgia for the original church. In small towns, there are always factions and they can take unexpected forms. And perhaps that was the impetus for locating a beautiful, imposing monument on top of a hill in the middle of nowhere. I concede this is all speculation, albeit educated by the crumbs of information we have. Perhaps some scholar well versed in the split between Congregationalist and Methodist theology in 19th century New England towns can shed some light on this. The second question I contemplated as we bumped down the hill on our ATV was why that church had ever been erected there in the first place. Given the current layout of our Town, it’s an utterly improbable location for any kind of community structure. On the other hand, at the turn of the 19th century, Guildhall, like most small Vermont towns, was far more populated and had a far busier infrastructure, with a dramatically different development pattern. It’s hard to imagine now, but Guildhall Hill, lonely, remote and inaccessible as it is today, was once quite busy. The stone walls lining the criss-cross of old logging roads and snow machine trails throughout this backwoods area attest, ironically, to a much busier, complex world in this small and declined municipality. There’s a certain sadness to the lonely Guildhall church monument. How many similar architectural beauties sit in towns around Vermont and New England, hidden away, almost lost to the overgrowth of bramble and forest, left unmarked deep in woods or at the top of hills? How long before no one remembers them at all?